The mystery of what goes on in a cat's mind will likely never be solved, but allow us to present a hypothesis: me me me me me me me me me. To be clear, this is not an indictment of pretty kitties; in fact, their vanity is part of their charm, like a child playing dress-up, or a Kardashian. This occurred during a Premier League game between Everton and Wolverhampton Wanderers on Saturday. In short, a black cat made its way onto the field during the 67th minute of the match, as Everton was down 3-1. "Someone with a wry sense of humor has smuggled Tiddles into the stadium this afternoon," the announcer observes. As the pretty kitty trots about for a while, with surprising agility, the crowd chants, "Sign him up, sign him up!" For the most part, no one even tries to do anything, possibly out of fear of embarrassment, possibly out of respect for the cat's gumption. Finally, as the announcer requests the stats for how many yards the cat has covered, it’s chased from the pitch. 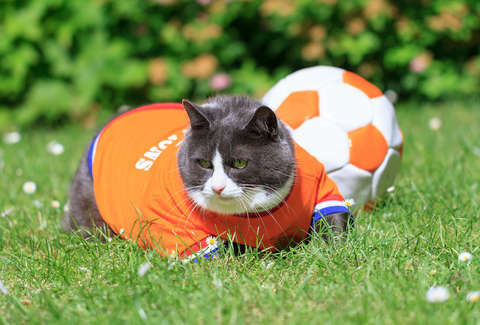 Hopefully, the cat will be playable in next year's FIFA.